Field Notes: Leaves: Move 'em or Mow 'em? 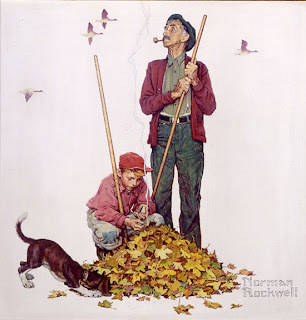 Leaves: Move 'em or Mow 'em? All the beauty of autumn eventually lands on our lawns. Pleasant childhood memories of jumping into piles of leaves are quickly supplanted by the drudgery of raking them -- or herding them with a leaf blower. Yet there is another option: mowing them. If you have deciduous trees, you have leaves falling – often a lot of them. Whether you manage them yourself or hire someone to take care of them, it’s time for all of us to think about how (and where) we dispose of our leaves. Most of our communities here in Westchester have leaf recycling programs. We put our leaves by the curb, either loose or in bags, and local government collects them. Some communities have a facility for turning the leaves into mulch or compost onsite while others truck the leaves away to larger facilities that are often hundreds of miles away. The cost of leaf collection and disposal is causing many of us to question whether we’re spending money and squandering resources in order to get rid of something that is actually valuable – leaf mulch. Many communities are discussing whether to stop collecting leaves entirely, a move that would improve their budgets. (Leaf collection can cost a municipality hundreds of thousands of dollars.) Several university studies have demonstrated that mulching leaves in place does no harm – and may do a lot of good. Mulching leaves returns nitrogen to the soil; lawns need nitrogen to be green. If you currently apply nitrogen to your grass, mulching will allow you to use less. Mulching mowers have become increasingly common both for do-it-yourselfers and for lawn care companies; these mowers were designed to return grass cuttings to the lawn where they decompose and return their nutrients to the soil. The mowers do a good job of shredding leaves as well, with the same results. So how do you begin? Start mowing. Studies show that, even when mulch is piled 4 to 6 inches high, the lawns do well. It’s safe to say that our lawns will usually benefit from as much mulch as all the trees in our yards can produce. If the mulch is so deep that the grass isn't poking through though, it’s probably time to redistribute it. As you probably know, different trees have leaves that differ in their chemical makeup, for example oak leaves are more acidic than maple. One of the benefits of mulching with a mower is that the leaves are shredded where they fall: beneath the tree that grew them and will benefit most from their decomposition. One place where you may have to take out the rake (or the blower) is your perennial bed. If your bed is bare for the winter, you can wait until the first hard frost and then mow right over it. More typically though, our beds include shrubs or perennials that have attractive winter forms: for these locations, you’ll need to remove the leaves, shred them and then pile them back on. A thick layer of leaf mulch on these beds will help to insulate them from temperature fluctuations over the winter. It’s important to shred the leaves rather than leaving them whole, however, because a thick layer of whole leaves will inhibit growth. Whether you choose organic or traditional lawn care, leaf mulching is a good strategy. The shredded leaves nourish, insulate, keep the grass greener longer, reduce the need for soil amendments, increase beneficial microbial activity and actually make the turf feel springier. So you improve your lawn, help the environment and save money.